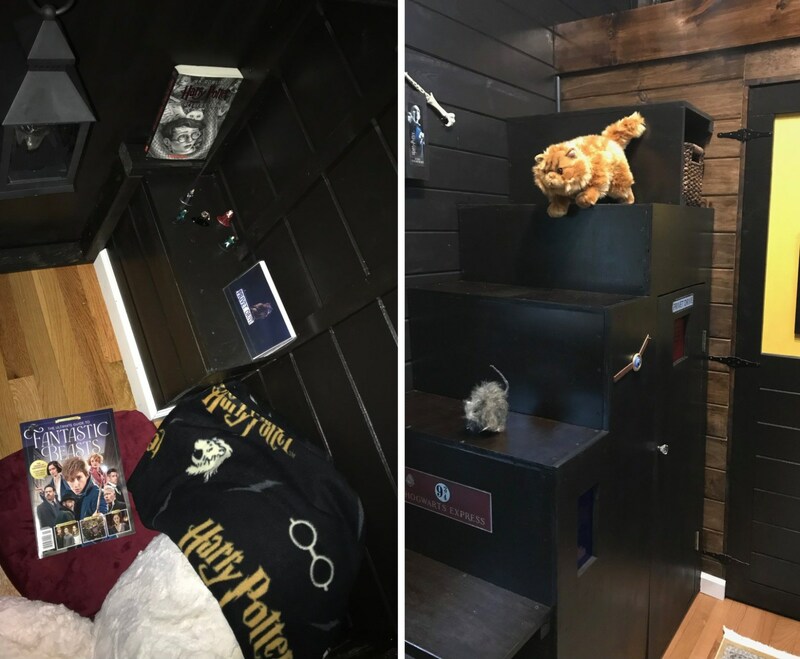 Harry Potter fans can now have the ultimate Hogwarts experience in this Harry Potter-inspired tiny home. 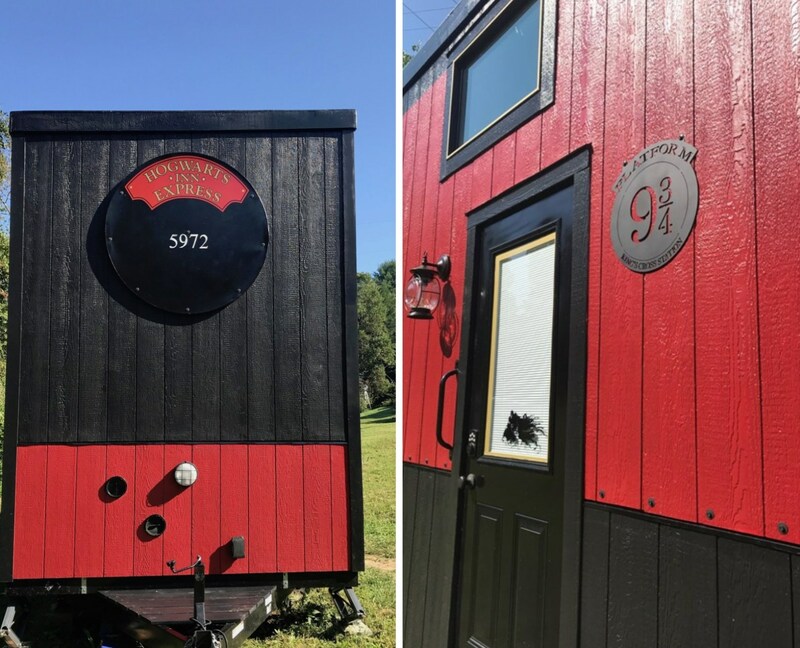 Located in beautiful Asheville, North Carolina, the Hogwarts Inn Express is a black and red 204-square-foot tiny house on wheels that is completely decked out in Harry Potter-themed memorabilia, and currently on sale for $99,000. 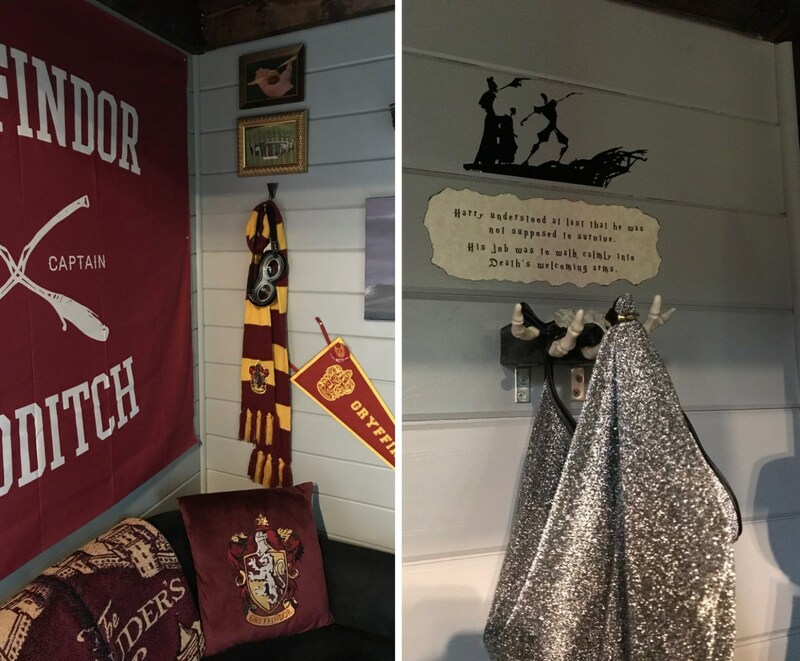 Stepping into the compact home, fans will be able to enjoy the carefully decorated space with over 100 licensed Harry Potter products along with many handmade items. The interior is laid out to represent each House of Hogwarts, with touches of the popular book series on display throughout the living space. 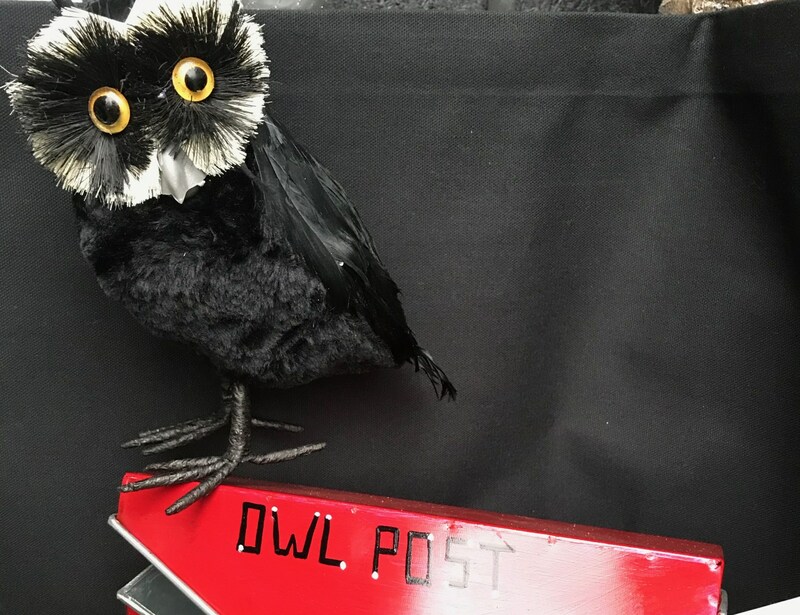 Even the black and red exterior has a welcoming plaque that pays homage to Platform 9 ¾ – the fictional train platform located in King’s Cross Train Station in London. However, although the details put into the home is incredibly impressive, it’s not all witchcraft and wizardry at Hogwarts Inn. 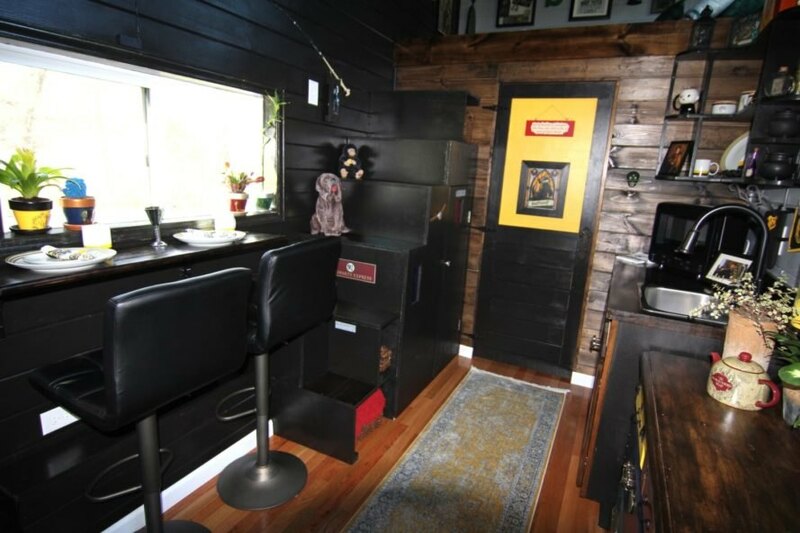 The tiny home is actually a fully functional home on wheels. The dark black and wood “Gryffindor” living room has a convertible sofa, a smart TV and coffee table. A small chair next to a mini wood-burning chimney is the perfect spot for reading or re-reading J.K. Rowling’s beloved books. 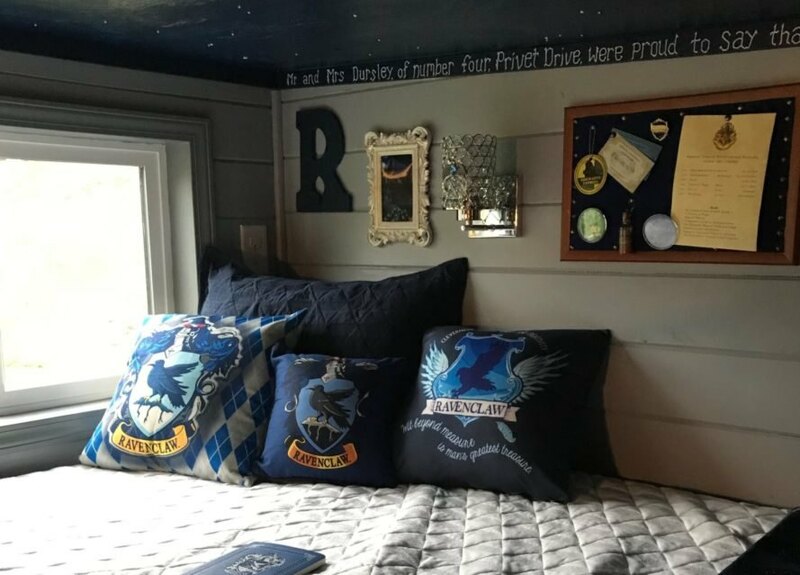 There are two sleeping lofts, a master Ravenclaw loft that has enough space for a double mattress and a smaller loft over the bathroom that fits a small twin mattress. This cozy space is reached by “Cupboard Under the Stairs”, which adds plenty of storage space. The kitchen comes with a large sink, fridge, and portable cooktop and the large bathroom with standard shower and vanity. Built on a RV-compliant trailer, the Hogwarts Express is also ready to travel. 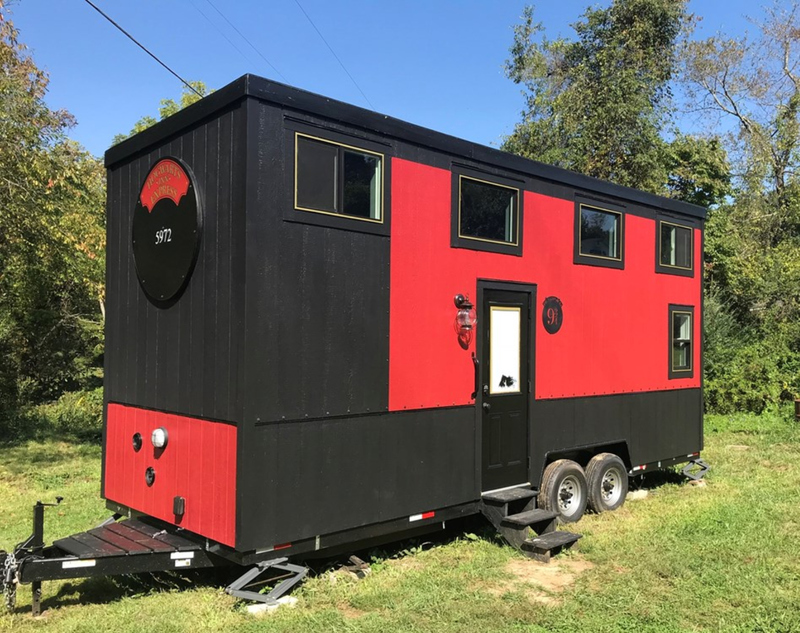 Additionally, LP Smartside panel siding on the exterior, double pane windows, closed cell insulation, and a portable heat/air unit make the tiny home on wheels perfect for almost any climate. 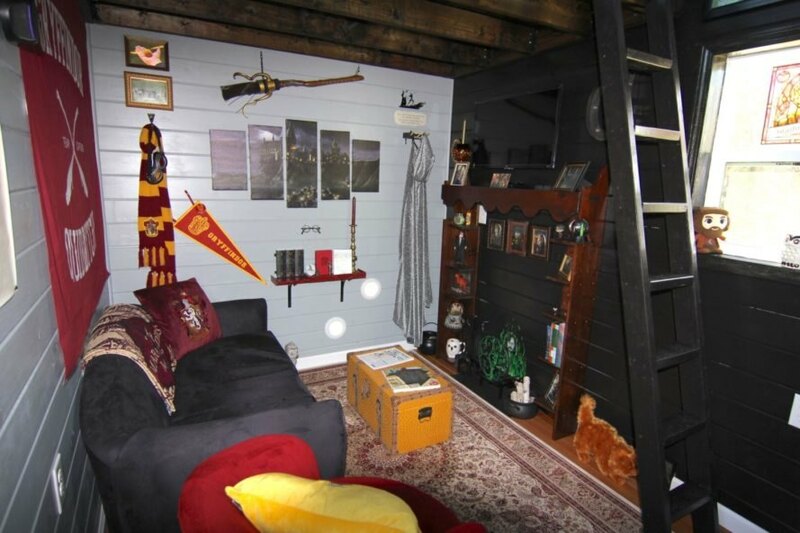 The Harry Potter Tiny Home is just 24 squared feet. 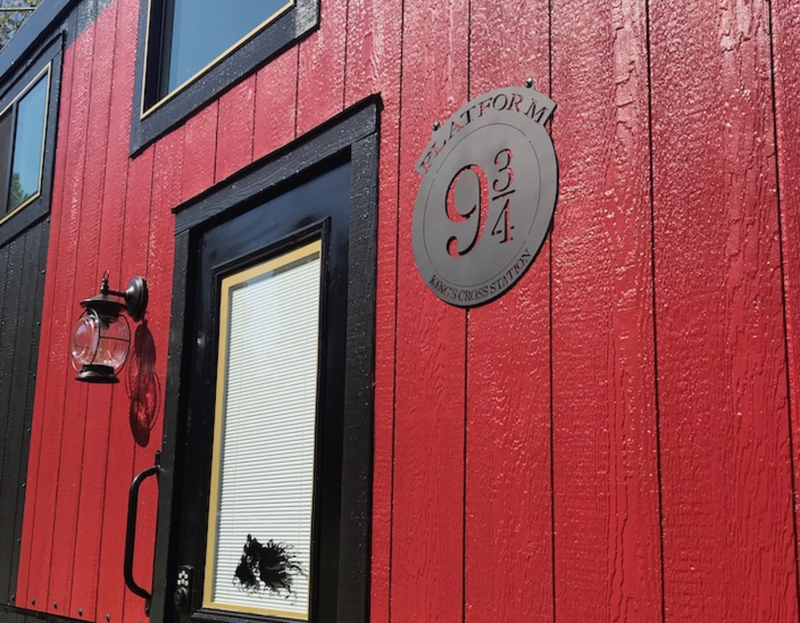 The Harry Potter Tiny Home is listed for sale for $99,000. The exterior feature a plaque paying homage to the books' Platform 9 ¾. The exterior is red and black. The dark black and wood "Gryffindor" living room has a convertible sofa, a smart tv and coffee table. A small chair next to a mini wood-burning chimney is the perfect spot for reading or re-reading J.K. Rowling's beloved books. 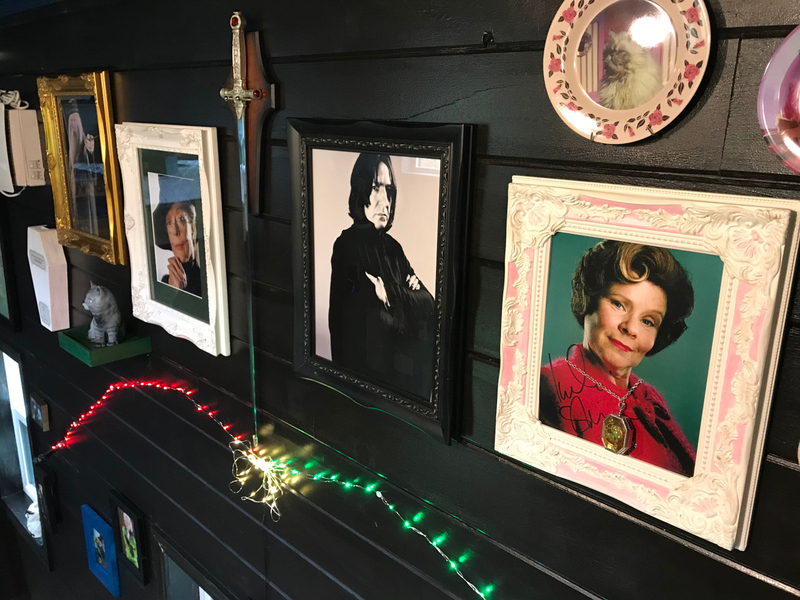 The home is filled with licensed Harry Potter memorabilia. It's like your sleeping in Harry Potter's bedroom at Hogwarts! The detail of the Harry Pottter-themed features is quite impressive. The dark interior is meant to evoke a sense of wizardry. 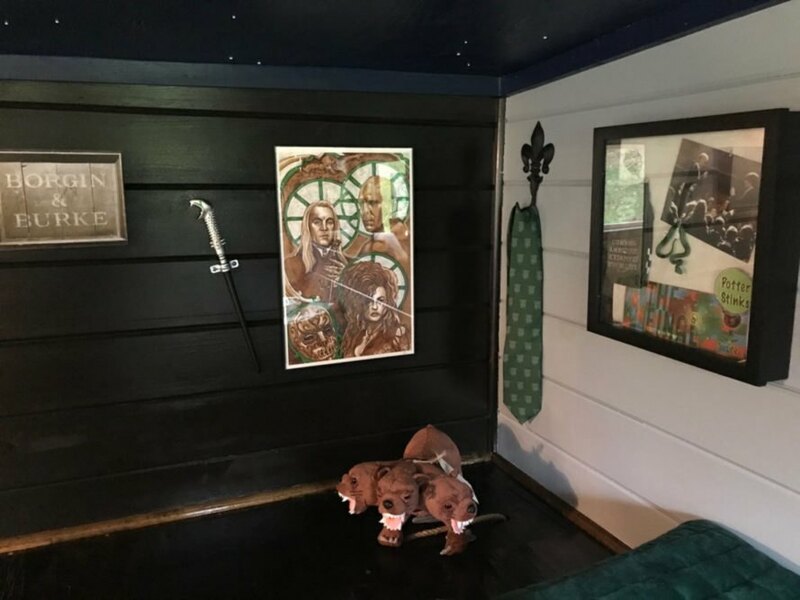 Even Hedwig makes an appearance in the Harry Potter Tiny Home. Guests can enjoy the many portaits. 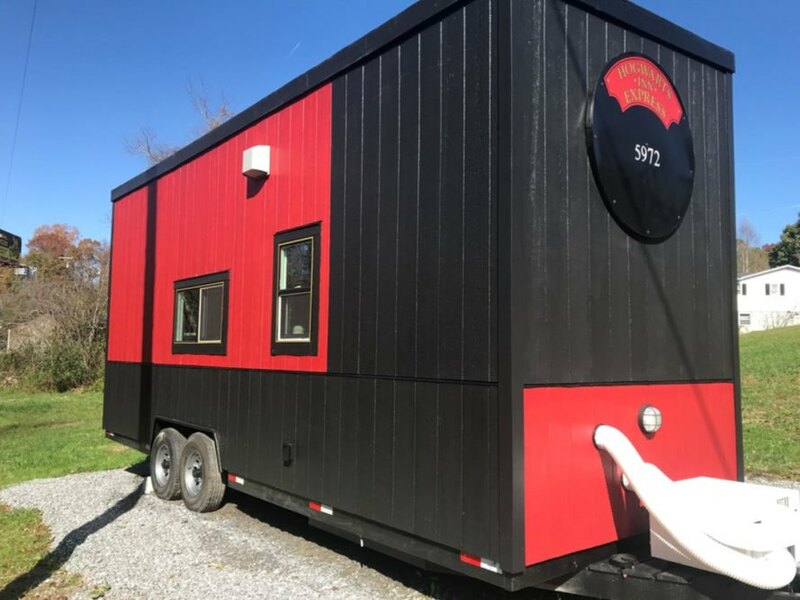 Read your favorite Harry Potter books inside this tiny home on wheels .